This has been a really exciting year for us. The blog has been growing by leaps and bounds. Though the summer has been a bit slower, we had an amazing 12.7K views in April and 14.8K in May. 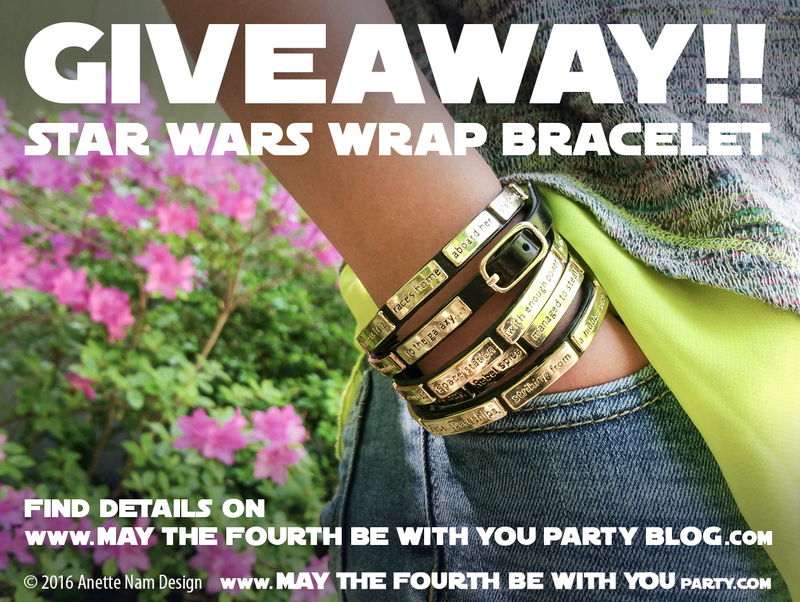 So to celebrate, we are giving one lucky follower one of our all-time favorite Star Wars blings – the Star Wars (Opening Crawl) Wrap Bracelet, courtesy of Love and Madness. (You can read my review and see more pictures of the bracelet here). Currently, we have about 600 followers across all social media. Once we hit 800 followers across all media combined, or once Halloween rolls around (which ever comes first) we will do the drawing. Start by following us on any or all of our social media accounts: WordPress, Tumblr, Twitter, Instagram and Pinterest, or like our main page on Facebook. Once you have followed us, simply repost, retweet, share, or pin ANY of our posts/shares/tweets/pins (old or new) from within that particular app. Encourage your friends to do the same! Once we hit 800 followers or just after Halloween, I will collect all the eligible entries, and my #1 will randomly draw one name. I will announce the winner on all venues. The winner then has a couple of weeks to contact me via DM/Comment to give me their name and mailing address. If the person does not come forward within 2 weeks, I will draw and announce a new name. Good Luck! And let me know if you have any questions.